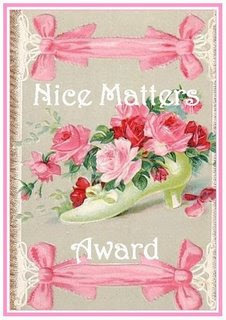 Ages ago, Amy from Petticoat Lane tagged me along with 6 others for the Nice Matters Award. Amy that was so nice of you to do that. Thank you. I must have been away because I missed Amy's Nice Matters post! But anyway you have to tag 7 other people.